With the centenary of the end of the First World War fast approaching, the time to reflect on the millions of soldiers who valiantly gave their lives a hundred years ago has never been more important, especially as their sacrifices ensured that a better world would still be going strong a century later. It is also an opportune time to reintegrate R. C. Sherriff’s groundbreaking and monumental play Journey’s End into the popular consciousness; first performed only ten years after the War ended, it struck a nerve with audiences for its brutal and emotional depiction of a conflict still fresh in people’s minds at the time, and has gone on to become an essential piece of war-based literature that still to this day remains as sharply on-point as it was back then. This new film version of the play, directed by The Duchess and Suite Française filmmaker Saul Dibb, is only the second major English-language adaptation for the screen after the 1930 version starring Colin Clive and David Manners (a German-language remake was made in 1931), meanwhile it has also been made for television on a couple of occasions. But this new version is a strong and powerful reminder of the story’s timeless depiction of a dark era in early 20th century history, even as we approach a hundred years after the fact, and is a worthy addition to the legacy that Sherriff’s play first crafted when it first debuted. In case you aren’t familiar with the play – and it’s understandable why, seeing how it’s barely taught about on the current school curriculum – it is set over the course of a few days in the mud-drenched trenches in Northern France during March 1918. A German offensive is imminent, and all that the British soldiers can do is wait for the inevitable and hold their ground as much as they can. They are led by Captain Stanhope (Sam Claflin), who has become a bitter and alcoholic shell of his former self thanks to the many years he has served in this war, and whose disillusionment with the conflict has evaporated all sense of hope and glory within him. He is nonetheless taken aback when he learns that a young and naive new recruit, Second Lieutenant Raleigh (Asa Butterfield), who knew Stanhope from school and who also happens to be his girlfriend’s younger brother, arrives having requested to join his ranks, and his mental state doesn’t get much better from there as he sends more and more soldiers out to die and experiences breakdown after breakdown as the pressure builds up to prepare for the forthcoming attack. At the time, this was provocative storytelling as it was depicting a realistic and emotion-fuelled scene of war that directly juxtaposed the patriotic call to arms that went out to the general public from 1914 onwards; of course, nowadays we see this kind of bleak depiction of the First World War everywhere in media from several films to even comedy shows like Blackadder Goes Forth, but that doesn’t for a second detract from the raw grip of the broken human spirit that Sherriff’s writing captured and continues to capture to this day, and Dibb as well as writer Simon Reade adapt the core spirit of his play into a more expansive cinematic world while also retaining its sheer intimacy. Scenes and characters outside of the original text are added to give it a larger feel, which for a film is necessary to expand the canvas otherwise you run the risk of staying in the one location the entire time and really feeling like a filmed version of the play as though it were a National Theatre Live broadcast. Dibb and Reade give such a tale of heartbreak that was all too common in the First World War a serious punch through carefully constructed scenes of dialogue and feelings of disorientation as we follow certain characters onto the battlefield during a daytime raid, with shaky camera work that puts you in the situation as you’re running for cover under heavy German fire. It’s a solidly made movie that both director and writer have adapted lovingly from the source, without sacrificing much of its authenticity. However, it is the astonishing and gut-wrenching performances of the ensemble cast that really drive home how emotionally draining the situation must have surely been. Sam Claflin, in a role once occupied by a young Laurence Olivier, is truly outstanding in this film; this is a side of the actor people have barely seen before, one that’s consumed by such overwhelming grief and self-loathing that you pity his character’s state of being as much as you root against his stubborn and unruly manner towards his fellow soldiers as well as himself. The rest of the cast, including Butterfield whose baby-faced poise really adds to his character’s wide-eyed innocence and misled optimism, Paul Bettany as a kindly lieutenant who acts as the moral centre of the characters’ conflicts, and Toby Jones who plays the trench’s cook that could have greatly inspired Baldrick’s role in that fourth series of Blackadder for all we know, are all really strong here and in some cases have never been better, especially Claflin who is the film’s MVP by far in a performance that should give the actor far more credit than just the pretty-boy types he’s usually known for playing. It’s a strong movie that reminds us all of just how unforgiving and brutal the First World War was on so many people who volunteered to fight, and as we approach one hundred years on from its end, it’s more opportune than ever for this timeless piece of text to make its way back into the public consciousness, and what better way to do so than with a film like this? 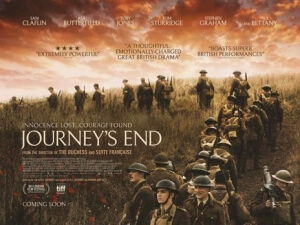 Journey’s End is a powerful and emotional new adaptation of R. C. Sherriff’s provocative and timeless wartime play, which is made all the more stunning through its solid filmmaking and especially its fantastic acting including a brilliant turn by Sam Claflin.